Sometimes there's an advantage to delaying these articles. Several times I've taken a full array of photos only to find out I have to do it differently or over again. Mounting the transmission T.V. cable is a good example. This is the final photo from a series of photos taken when I installed the first cable. It was a universal fit cable that was given to me when I picked up the transmission. There were two problems with the cable – it was 3-inches too short and the telescoping "one size fits all" housing wouldn't hold under pressure. I made a call to the folks at Lokar and they fixed me up with an extra long custom cable and it was at my doorstep in a manner of days. If I had it from the start it would have saved me a lot of time but I learn better the hard way. The T.V. 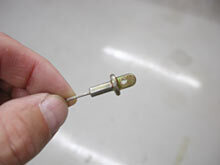 (Throttle Valve) cable on a 700-4R transmission controls line pressure, shift point, shift feel, part throttle downshifts and detent downshifts. The cable pulls on a small rod in the transmission as the throttle pedal is pushed – so it moves opposite the throttle cable. This shot shows the small S-shaped hook that the T.V. Cable attaches to. 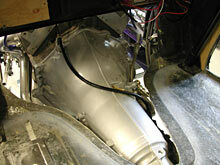 You can see the new transmission cooling lines at the top of the photo. 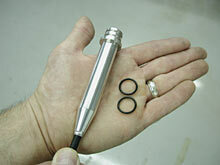 This is the cable end that attaches to the S-hook. 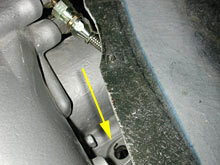 The end of the cable housing that attaches to the transmission has a machined aluminum end to keep the cable from kinking and to make a seal against the transmission. 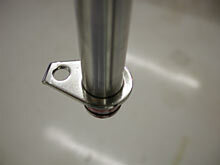 Two rubber O-rings are installed in the two rings in the end of the aluminum mount. 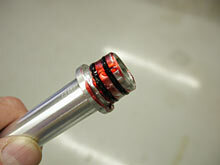 The O-rings were lightly greased to help them slide into and seal against the hole in the transmission case. A chrome steel clip that comes with the Lokar cable is then slid down the housing until it rests against a lip on the aluminum mount.